I’m enjoying Malcolm Gladwell’s latest book, Outliers. In the same vein as Freakonomics, it looks deeper into why certain people or events deviate from the norm, become exceptional – why they are “outliers”. It’s helped create a new view on something that has puzzled and frustrated the world of Digital Radio, and handily includes references to Aviation and Korea, which is where we start. One of the chapters in the book is called “The Ethnic Theory of Plane Crashes“, and describes the infamous crash of Korean Airlines flight KE801 into Guam in August 1997. (There’s an episode of Air Crash Investigation that covered it – Part I, II, III, IV, V). To summarise, the pilot flew his 747 plane into the ground, despite the instrumentation and the crew being well aware of what was going to happen in good time to be able to avoid the accident. 228 of the 254 passengers died. 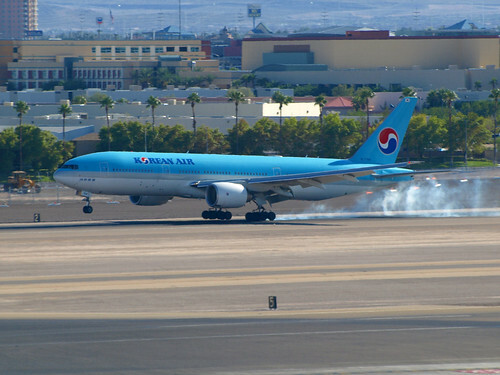 It happened at a time when Korean Airlines was putting planes into the ground with worrying frequency. In the book, Gladwell says Korean Airlines was crashing planes 17 times more frequently than United Airlines. This wasn’t due to badly maintained aircraft, or dangerous conditions – the crews just kept crashing their planes. (I don’t know if “17 times” is accurate, but I do know that it’s a well established rule in flying circles never to fly KE metal, and one I have myself stuck to rigidly, preferring to route LHR-FRA-ICN on my trips to Korea). The obvious conclusion is that Korean Airlines crews were incompetent, but Gladwell suggests it wasn’t incompetence – it was deference. The Korean culture is so deferential to figures of authority or power, the members of the crew who could see danger increasing simply did not feel that they could bring it to the captain’s attention. It was socially unacceptable for them to question his judgment, or even infer that he wasn’t fully aware and in control of his aircraft. Looking at the transcripts from the flight recorder, it’s excrutiating listening to the First Officer hint and suggest to the Captain that they might actually be flying straight into the ground. Only when there’s less than 7 seconds to impact does the First Officer clearly call for a “Go Around”. Too late. This degree of deference can be measured – the PDI (Power Distance Index) measures the degree to which people are deferential to figures of authority or power. The PDIs of many nations (cultures) have been measured, and there is a remarkable correlation between the amount of deference in a in culture, and the plane crashes in those countries. It seems to be that such a degree of deference negates the value of having subordinates to help provide vital input and monitor situations. So where’s the connection with Digital Radio? It turns out that there’s another nation with a high PDI. France. France has a PDI value of 68 – it’s a highly deferential nation. (In context, Britain and Germany have values of 35, and Austria just 11). All of a sudden, things are clicking for me. Here’s why. France chose a non-standard version of DAB – a cut-down version of mobile TV (basically, mobile TV minus the video, or with very little video). Something that the Koreans (them again) invented and dubbed T-DMB. The most prominent figure in that decision for France to the use Korean originated T-DMB system was a man called Sylvain Anichini. M. Anichini was the Director of Technology for Radio France – in hierarchical terms, he was pretty much at the top of the roost in French Radio. For whatever reasons he had, he became a passionate and vehement supporter of T-DMB. And he would give not a moment to anyone who didn’t agree with his decision. It’s maybe understandable that he repelled approaches from the other DAB nations, on the basis that his “sovereignty” might be undermined. I believe he stormed out of more than one WorldDMB meeting, and was very insulting in public session to a number of fellow professionals. It might also be the case that M. Anichini found dealing with Koreans, and their deferential culture, much more appealing than dealing with those apparently insolent and disrespectful English and Germans. What’s interesting is the number of people within the French radio industry who privately disagreed with both M. Anichini’s decision, and his behaviour. I’m aware, both directly and indirectly, of heavy sighs when discussing the path being followed, but I (and others) could never understand why those people who were uncomfortable with the direction taken would never raise the issue more openly. I was obviously failing to understand the immense gulf between our culture and the French culture, and what appears to be a overriding and almost smothering cultural barrier to challenge bad decisions made by a person above you. (Maybe this is also why the French are so apparently tolerant of the dalliances of its politicians?). What was happening in France with DAB had parallels with what happened to flight KE801. One man, whether intentionally or just out of disorientation, was about to bring everything crashing into the ground, and his subordinates and colleagues could not do anything to stop it. Of course, with Digital Radio, nobody got hurt (apart from a bit of pride) and nobody died. Compromises were made, and positions adopted that allowed the French decision to accommodated, albeit at a financial cost for the entire DAB community worldwide. M. Anichini left Radio France at some point after the decision was taken, but before licences were awarded by the CSA. So what did Korean Airlines do to turn around their appalling safety record? They hired an American and enforced the use of English in the cockpit, as a way of breaking down the deferential barriers created by the Korean language. It seems unlikely that the same approach would be appropriate for Digital Radio in France. Hmmm. Reads like racist claptrap to me. The Brits are so superior to the French that now they are stuck with legacy equipment and can’t upgrade to DAB+. As for Germany, digital radio has been going nowhere for a long time – it’s a total mess. At least the French have got a plan. Freakonmics has got nothing to do with people departing from the norm. It’s about applying economic theory to subjects as diverse as gang violence and choosing baby names. Maybe that’s a more useful way of looking at the decisions taken in the UK and France. France likes national champions and discourages competition. I believe that the main concern of the established players on the French radio scene is that a more spectrum-efficient system would attract newcomers. The reference to Freakonomics was more to demonstrate the principle of going beyond the obvious explanation to find alternatives, potentially supported by more empirical data. Gladwell’s conclusions are his own, but I’ve drawn on those to try and understand why the French chose to do something different *even when* people in the French industry didn’t necessarily agree with it. It’s interesting that you say “France likes national champions and discourages competition” – that sounds like a culture that preserves hierarchy and is uncomfortable with challengers? Arguably, if the UK hadn’t done *something*, nothing would have happened. It’s a shame that our first-mover advantage makes it harder for us to migrate to a more modern solution, but I can’t see how we can be criticised for using the solution available at the time. The Germans – well, there’s a situation for another, longer, discussion. You’re not listening – it’s about economics, not culture. When there are more people competing for advertising revenue, it is harder to stay profitable. RF has to protect market share to prove that public service is not a waste of money. Oh and I don’t believe that RF is any more hierarchical than the BBC. I haven’t discussed the motivations behind the French choice of T-DMB, as they’re complex. You may be right in what you say. My point is this – there were people throughout the French industry who *did* disagree with the pursuit of T-DMB as a solution, but seemed unable to speak up or start a discussion. In “Outliers” there’s an explanation (with empirical data) of a cultural environment which might explain this. I just wonder whether the recent news from Germany will cause a total rethink in France. The prospects for DAB+ in Germany are now looking extremely bleak following yesterday’s decision by the KEF not to release funds to public service broadcasters. If the Germans are not on board what hope is there for DAB+/T-DMB being fitted in European cars as standard? I understand that from an external point of view the choice of T-DMB is quite hard to understand. But even if some aspects are not very clear, the complete process that led to this choice is easy to understand. The french radio market is very developped and the program choice, in most urban areas, offers more than 25 programs in FM. Main groups are Radio France (public radio), NRJGroup (4 national networks), CLT (3 national networks), LAB (3 national networks). There are also some other powerful national networks (skyrock, RMCInfo, MFM), smaller “multi cities” networks, and local independant stations. When the CSA (the french broadcasting authority) decided that radio had to turn to digital, the major private broadcasters first decided that they would do everything possible to delay – or even better, kill – the process. FM is highly profitable, and they feared that they could lose market shares, specially in a difficult context for music stations. Spending money for digital, and the risk of increased competition was not desired. What is more surprising is that mr Anichini (public radio) was a part of what was known as “GRN” (an informal association of the biggest radio groups). It appeared later that mr Anichini was plying its own game, and that the former Radio France’s president, J.P. Clusel, was not informed about all that was happening. The digital radio problems are quite technical and I suppose that mr Anichini did what he could to make this as obscure as possible so that nobody at RF’s head could interfere with its own private interests. When it became clear that the CSA really wanted radio to go digital, and that it would become hard to stop that, the GRN decided to promote the system that would limit the number of possible stations. The official arguments to chose T-DMB were that this system was the “sexiest”, allowing video, BIFS… Those big groups all have FM music networks that are losing listeners every year (because of mp3 players and webradios), and the T-DMB was supposed to have the qualities required to make radio competitive again. The unofficial reason was that fully using the capacities of T-DMB requires a sufficient bitrate, and that naturally reduces the number of stations per multiplex. But in a way the GRN failed. First, there was a legal obligation for the CSA to offer the possibility for all existing stations to go digital on their existing FM areas, so it was necessary, for exemple, to have the capacity to put the (about) 50 FM stations of Paris on T-DMB. Then the CSA knew that the success of digital radio resides in an increased offer. Who would buy a new receiver to receive what’s already available on the FM band ? The result is that T-DMB will be used at low bitrates, which is enough to do bad radio (the promise of higher audio quality disappears), DAB+ would have been more efficient. And most of the GRN’s big radio groups projects for new networks have not been retained by the CSA: NRJGroup will have it’s 4 networks on the digital radio, LAB will have one more radio (so 4 radios too), and the same for CLT (4 radios instead of 3 in FM at the moment). They all wanted 2 or 3 new networks. So, to reply to previous messages, I would say that Tina is right, its all about money and not cultural environment (I’m talking about that digital radio problem, not about other things where there can be cultural influences). And when Nick Piggott says “there were people throughout the French industry who *did* disagree with the pursuit of T-DMB as a solution, but seemed unable to speak up or start a discussion” it must be precised that the question is all about “how many people disagree” and what is the weight of these people in the market. It must be understood that the biggest radio groups have the money/people/power for doing powerful lobbying at the “Ministère de la Culture et de la Communication” and “Ministère de l’Industrie” (LAB is a part Lagardère Group, which is a little bit more than just a radio group). Particularly thank you to Ben for the comment explaining the process through which T-DMB was chosen. What was interesting, and something I never really appreciated, was how completely united behind M. Anichini’s concept the entire French radio industry (the GRN?) appeared to be. This is in contrast to other countries where there are public discussions about DAB, DAB+, DRM, DRM+. DVB-H, HD Radio. That was even more interesting when I understood that some people in the radio industry privately disagreed with the choices, but publicly supported them. Gladwell’s explanation of the situation at Korean Air chimed as an explanation of how culturally people agree to not challenge the decisions of a superior – to be deferential to their experience and position. That’s not a criticism, incidentally. It’s a recognition that different cultures do react to situations differently, and that insight can help people better understand differing views and behaviours. We learn so much from looking outside our normal sphere of experience, it’s amazing.